All students must remain on school property during school hours. Any exception to this policy must come through a written request from the parent or guardian with final approval of the principal. 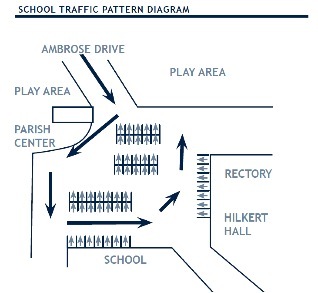 Please follow the Arrival and Dismissal Diagram when picking up students. Do not pick-up or drop-off students in the front of the building (Pearl Road lot). The front lot is reserved at arrival and dismissal times for bus transportation. Do not park in the front lot before 8:15 am or after 1:45 pm on school days. Students are to be picked up only in the back parking lot (north east lot) during arrival and dismissal times.